After graduating from Kean University of NJ with a Fine Arts degree, Barbara Jean Lloyd taught art for awhile, created the art for many album/CD covers, and opened her own public relations company. Now a full-time working artist, she creates in Acrylics, Oil, Mixed Media, Collage, Digital Fine Art/ Photography, Assemblages, and whatever else strikes her fancy. Awards include First Place in ABQ Art Review’s April 2012 Showdown: Protest Art, the Art Buzz Graphics & Acrylics Competitions, four “Special Recognition" Awards from Upstream People Gallery Juried Exhibitions, and a Body-of-Work Award from Mosaic Globe. 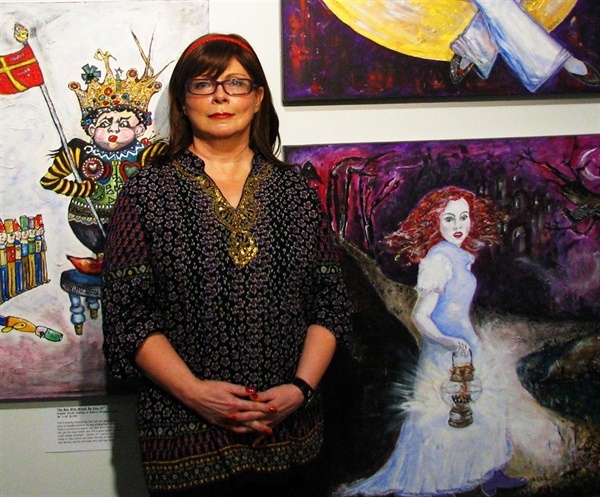 Her work has been published in the Art Buzz Collections 2009 & 2010, Suspense Magazine, Hidden City Quarterly, CT Creative, The Bullet, Sonata, Status Hat Press, Art Hash and more. “For me, art is all about telling stories, setting a mood, starting conversations. It’s like a window that opens onto my subconscious, where I collect the bits and pieces I find there and allow them to tell a tale. My art creates a distinct atmosphere - of mystery, whimsy, organic movement or unnatural stillness. Certain pieces may be light-hearted, others unnerving. But, as long as my art engages the viewer in a satisfying dialogue, I consider it a success." WATCH THE ART GALLERY'S VIDEO - CLICK ON "EVENTS" ON MENU PAGE.